Would you like to show off a gleaming, brilliant look? 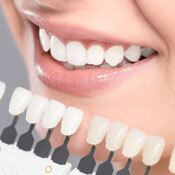 Teeth whitening involves a simple, safe procedure that rejuvenates your smile. It’s normal that over time, teeth can become discoloured. QVC Dental Port Kennedy offers you in-chair or take-home teeth whitening options to enhance the way you look and feel. A single 90-minute visit is all that you’ll need to brighten your teeth. A whitening gel is applied by one of our experienced team members, then activated with a special light. You’ll be monitored throughout the procedure for the best results. You’ll also be sent home with a kit including customised trays so you can top up your whitening. You can take advantage of our special offer and complete this treatment for just $499 (a $699 value). If you’d like to complete teeth whitening from the comfort of your home, take-home kits are available. You’ll receive our professional guidance on how to proceed, then can complete treatment at your convenience over a period of weeks. These kits are available as a special offer for $249 each (a $399 value). Contact us today to schedule your appointment! We offer convenient Saturday appointments and complimentary consultations so that you can learn more about transforming your look.